29th January 2013, Beijing – five environmental organisations (Envirofriends, Friends of Nature, The Institute of Public & Environmental Affairs, Nature University and Nanjing Greenstone) jointly released the Phase VI, IT Industry Supply Chain Investigative Report. The report confirmed that Apple has significantly improved its green procurement strategies as well as beginning to push a number of suppliers to improve their environmental performance and have made significant progress. 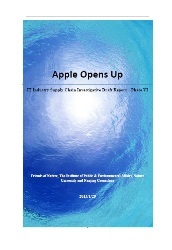 The report stated that in April 2012, after a long process of communication, Apple conducted alongside the NGO’s a trial of third party audits of their suppliers. They identified that out of the whole IT industry one of the most polluting, energy and water intensive component was the Poly Chlorinated Biphenyl (PCB) sector. As a result Apple has pushed three major PCB suppliers to undergo third party audits. The report highlighted the improvements that these companies made and highlighted their best practice in waste and hazardous water management and water use efficiencies. A number of other IT brands have strengthened the environmental management of their suppliers. As a result of pressure from Siemens, Panasonic, Nokia, Philips, Apple and Microsoft, more than 100 companies have provided explanations on the problems they had and what corrective action they have taken. Canon and LG to date still have not established a mechanism to identify problem suppliers, despite negative attention from Chinese and International environmental groups. of the 33 IT brands that have been ranked, HTC failed to respond to any of the NGO’s questions about pollution from its supply chain.